Below Sampsonia Way presents the third installment of Chávez Time, a series of interviews with Venezuelan media professionals about working under Hugo Chávez’s government. The first two installments were interviews with cartoonist Rayma Suprani and photographer Luis Brito. 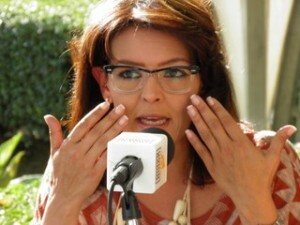 Maria Elena Lavaud, Book Fair 2012. Photographed by: Ylanu Cordero. Maria Elena Lavaud, writer and journalist, is the author of Días de Rojo (Red Days) and La Habana sin Tacones (Havana Without Heels). As the host of the talk show En Privado for Globovisión, she answered Sampsonia Way‘s questions via email and diagnosed the state of freedom of expression in Venezuela. The government has threatened to shut down Globovisión, the TV channel you work for. Why? The first reason is that the channel, as a private media outlet, has an independent editorial line. What generates great concern are not the threats to shut down the station, but the way the government uses the laws at its discretion and creates concrete measurements to harm specific targets. That has definitely been detrimental to us and freedom of expression in Venezuela. Any law is valid for the government when they need to find arguments to sanction the channel, or directly affect our duty as professional journalists and the technical operations of Globovisión. The government has confiscated our equipment and attacked us physically and verbally. The worst thing is that these attacks remain unpunished. Actually, the government hasn’t recognized the measurements dictated by the Inter-American Commission on Human Rights to protect the channel staff. Instead they have opened other legal processes against the channel. The Law of Social Responsibility in Radio and Television is a tool that could be interesting, but the problem is that the government uses it in favor of its interests. This law has been used to fine Globovisión because of our coverage of a prison riot that left dead and injured in various prisons. We denounced not only what happened, but also the lack of information from government sources. Globovisión gave the prisoners’ relatives a chance to denounce what was going on, but The National Commission of Telecomunications decided the coverage was inciting anxiety, justifying crimes, promoting intolerance, and disturbing the public order. They ordered a fine for 7.5 percent of Globovisión‘s 2010 gross income, which translated to roughly two million dollars and put the channel in check. Also a group of journalists covering Henrique Capriles Radonski’s presidential campaign were assaulted by government supporters. The attackers stole cameras and other equipment from our coworkers. The assault was never prosecuted by the authorities even though the channel presented legal claims. These actions have been recurrent through the last twelve years of government. Another example: The National Commission of Telecommunications (CONATEL) announced the availability of two radio frequencies that had previously been assigned to Globovisión: The State of Monagas’ 44 (UHF) and the State of Vargas’ 30 (UHF). In addition, the Supreme Tribunal of Justice supported this decision. Do you believe that journalists in Venezuela censor themselves? Why? If you go through the titles of the articles published by Espacio Público (Public Space), an NGO that promotes free expression in Venezuela, you will find the following: The managing director of Ávila TV was attacked in the State of Aragua; shootings target the newspaper Nuevo Día in Coro; investigation opened on cartoonist Roberto Weil for his work regarding water contamination. Self-censorship is not an option when you have the responsibility of informing people about the laws. Nevertheless, I can give you examples of the opposite: Recently, talented musicians in Venezuela were given awards. The ceremony was broadcast by a TV channel which omitted most of the artists’ statements because they called for an end to violence and crime in the country. This was a clear act of self-censorship that has been rejected by society in general. Have you ever censored your work? During my 17 years of journalistic work for Globovisión (14 of which I dedicated to producing Grado 33, a space for investigative journalism and opinion) I can say that I have enjoyed absolute independence while doing my job. I can’t deny that on some occasions I thought about the content that could put my coworkers and the channel in danger before it hit the airwaves, but the duty to inform is the priority and great responsibility that comes with being a journalist. The human rights situation in Venezuela and freedom of expression are topics of great concern, now even to an international extent. The UN Human Rights Council’s Universal Periodic Review in Venezuela approved a report with 148 recommendations to improve human rights in the country. The UN countries that signed the report recommended that Venezuela protect freedom of expression and information for all people especially civil society, media organizations, and political parties without repression or persecution. However, Venezuela rejected all the recommendations related to freedom of expression and impunity.